Vivisection (pronounced vih-vih-SEK-shun) literally means the dissection or cutting of a living animal. The term has come to apply to any and all types of experiments on live animals, and it is a term to which many scientists object. People who believe that humans have no right to perform any type of experiments on animals are sometimes called antivivisectionists, although they can be more properly described as animal rights activists. Humans have been using animals for their own purposes probably from the earliest times, and some would say that the notion that people are more important than animals is taught in the Bible. The Greeks said that since animals could not think as humans did, they were a lesser form of life, and this notion was continued by Christians who said that since animals had no souls, they were not really important. With the beginning of modern science in the seventeenth century, animals were used as an easy way of understanding our own bodies. That is, a doctor would cut open a pig or a sheep and study its internal organs as a way of learning more about human anatomy. But cutting into a dead animal's body is different than performing an experiment on a living subject. By the nineteenth century, doctors were regularly using cows, sheep, and goats to study diseases. The French microbiologist Louis Pasteur (1822–1895) pioneered the use of vaccines by testing them on healthy animals. His unvaccinated animals died when they were exposed to certain diseases. Other great physiologists (scientists who study how the body functions) like Russian Ivan Pavlov (1849–1936) and Frenchman Claude Bernard (1813–1878) operated on dogs and left their surgical cuts open in order to better understand how their organs worked. Both men made major medical discoveries because of this. After World War II (1939–45), the use of animals in laboratories of all types grew enormously. Increasingly, dogs, cats, rats, mice, monkeys, and many other types of animals were needed by scientists for many different purposes. Animals were used for biological and medical research, as well as for the education and training of doctors and veterinarians; they were used to develop and test vaccines and new drugs; and they were used for the testing of commercial products such as cosmetics. Animal rights: The philosophy that animals have rights no less compelling than human rights. Dissection: Cutting and separating the body along its natural cleavage lines to allow scientific examination. The use of animals for experimentation has become a sensitive issue, and the opposing sides in this debate can both make persuasive arguments. Many of those in favor say simply that people are more important than animals, and that while it is unfortunate that animals must sometimes suffer and die, it is worth it if humans lives are saved by this research. They argue that two-thirds of all the Nobel Prizes for medicine or physiology awarded since 1902 have been discoveries made involving the use of animals. Those who argue that animals also should be used for medicine and product testing say that these tests are essential if our drugs and products are to be safe. In fact, the U.S. Food and Drug Administration, the government agency responsible for that safety, actually requires animal tests for certain medicines and eye-care products. Finally, the dead bodies of animals are used in schools to teach biology, and many high school students dissect frogs or even an unborn pig or a rabbit in biology class. There is no doubt that the use of all sort of animals in all sorts of laboratories requires that millions of animals be used experimentally. purpose, and most are kept caged in stressful environments. They are subjected to all manner of cruel and sometimes painful procedures, and in the end they are disposed of. Animal rights activists say that such research really does not save human lives since scientists cannot really compare the reactions of an animal with those of a human being. They also argue that new techniques can provide scientists with alternatives to testing animals. 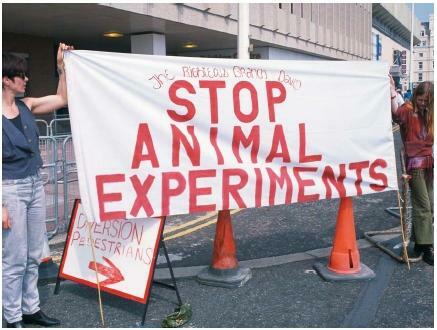 Opposition to vivisection has been organized since the last quarter of the nineteenth century when a strong antivivisection movement in England resulted in the Cruelty to Animals Act of 1876. Nearly 100 years later, the modern animal rights movement helped get the Animal Welfare Act of 1966 passed in the United States. These and later laws regulate the conditions under which animals may be used in laboratories, yet most who oppose them would say that they do not go far enough. The most active group in America, called People for the Ethical Treatment of Animals (PETA), has a motto saying, "Animals are not ours to eat, wear, experiment on, or use in entertainment." Although the numbers of animals used for experiments is dropping, animal research is still big business and, some would argue, an essential and very important business. The debate between the scientific community and those who oppose vivisection involves some very difficult questions. Animal rights activists believe that those who use animals experimentally, even though responsibly, should realize that their work treats animals as objects who have no rights. It also inflicts stress, fear, pain, and a lack of freedom on its subjects. Experimenters would counter this by saying that their work is essential to our way of life and to human health and well-being, and that there is no real substitute for animal experimentation. In the end, animal testing is a moral dilemma that each person must come to terms with on his or her own.